Wedding spending has reached an all-time high – again. According to The Knot 2016 Real Weddings study, which surveyed nearly 13,000 brides and grooms across the U.S., the national average cost of a wedding last year was $35,329, not including the honeymoon. 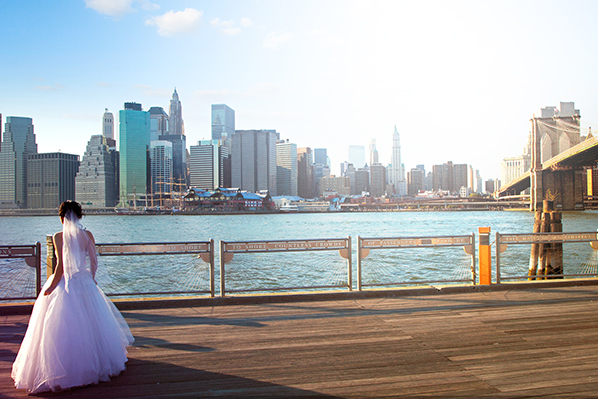 If you decided to get hitched in a big city like Manhattan, you could’ve spent more than double the national average! With a few exceptions, the Northeast comes out as the most expensive place to tie the knot, with the South and Midwest offering the most budget-friendly wedding locales. Arkansas comes in as the most affordable nuptial spot, but it’s not necessarily inexpensive, with an average wedding cost of $19,522. Some of these high wedding price tags may be attributed to higher average earnings. As of early 2016, the annual mean wage in Manhattan was $144,716, compared to an annual mean wage of $41,995 in Arkansas (as of 2015). With roughly three and a half times the average annual income, it’s no surprise that the average wedding spend is around four times as high in Manhattan. These average costs include everything from the reception, music, cake and flowers to transportation, attire, rings and officiant fees. Regardless of location, the biggest wedding day expense is venue, coming in at an average of $16,107, compared with $14,788 in 2015, according to The Knot study. The substantial increase in total costs isn’t due to a rising guest count, but to greater celebration customization, with details like photo booths, personalized stationary and custom-designed Snapchat filters adding to the tab. The average spend per guest rose to $245 last year, compared with $194 in 2009. To cut down on costs, couples can consider sensible swaps like more affordable flower arrangements, a couple signature cocktails in place of an open bar, and DIY invitations. But considering a more affordable wedding locale may be the best way to maximize savings. As for who is footing the bill, on average, the couple’s parents may pay for up to 44 percent of the wedding. Only 10 percent of couples pay for their own festivities. Regardless of how much of the bill you’re paying, average wedding costs, especially in big cities, suggest you’ll still be on the hook for a considerable sum. To foot the bill, couples and parents alike may need to rely on more than their current savings. For newlyweds juggling the cost of other money milestones surrounding marriage – a honeymoon, a home purchase or children – the cost of wedding day celebrations can add to an already overwhelming list of expenses. Rather than relying on high interest debt to fund the milestone or other goals that fall beyond their current savings, couples can use more cost effective personal wedding loans with favorable interest rates that allow for a repayment timeline, and monthly payment amount, that best fits their budget. A personal loan can also offer couples a way to maintain some of their cash cushion in savings while still funding the costs of their new life together. Couples who are still celebrating their engagement and have yet to begin the wedding planning process may want to consider the average nuptial costs in their city alongside the seasonal costs before deciding on a locale. They can position themselves for the best possible outcomes by starting to save up now. By prioritizing sensible financial preparations in tandem with other essential wedding elements like venue selection and dress shopping, newlyweds can save themselves from unnecessary stress come the big day, and enjoy what really matters, the celebration of their new life together.